Once upon a time, I used to post every week about what we are doing as read-alouds. I was doing that because I needed to feel accountable about actually reading to my kids. I strayed away from that, and then I strayed from doing the reading aloud too. Part of my decision to post this today is related to my recent review of IEW's Linguistic Development through Poetry Memorization. One of the greatest things about this program is that you get Andrew Pudewa's presentation "Nurturing Competent Communicators" as both a DVD and audio presentation. One thing that is highly recommended in this presentation is reading aloud to your kids, especially as they start reading for themselves. And to read a whole lot. It is hugely convicting. I'm totally convinced that my reading aloud made a huge difference for my teens, as I used to be pretty diligent about that. So I am convicted. Again. That I am going to start reading aloud regularly, even if I can no longer pull off two hours a day. 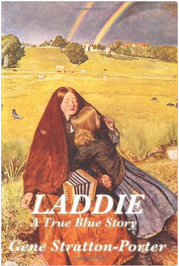 Laddie, A True Blue Story by Gene Stratton-Porter. We've only just started this, but everyone is loving it so far. My hope is to finish it up this coming week. Little Sister is who is telling this story, and so far we just love her. She adores her big brother, and we really are looking forward to learning more of her story. The only other thing we are doing as a read-aloud at the moment is a book called Secrets of Ancient Man. I'll be reviewing that soon.